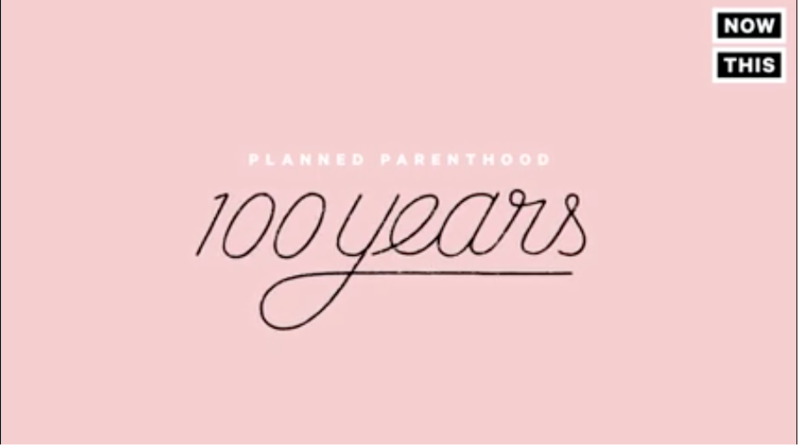 Lena Dunham, JJ Abrams, and Meryl Streep create documentary film about Planned Parenthood’s first 100 years of history. How would you describe eugenics? Well if you are Hollywood stars defending the nation’s largest abortion provider, you may use the word “ugh” to describe the idea that led to the forced sterilization of hundreds of thousands of people worldwide and the slaughter of millions through the holocaust. Somehow, “ugh” does not cut it. Yet, that was the word Lena Dunham used in her newly produced short film 100 Years, celebrating Planned Parenthood’s 100th birthday by presenting a rather unique telling of its history. The film starts by recounting part of Margaret Sanger’s biography. After all, it would be hard to have a “documentary film” about Planned Parenthood without discussing its founder. While there is a lot worth critiquing in Dunham’s “documentary,” it is worthwhile to dwell a moment on her description of Sanger’s belief in the “science” of eugenics. As a refresher, eugenics (as defined by Webster’s online dictionary) is, “a science that tries to improve the human race by controlling which people become parents.” Dunham is correct in stating that this view was popular during the 1920s-1940s. What she neglects to mention is with whom this idea was popular. Eugenics formed the philosophical foundation for forced sterilization laws throughout the United States. Southern states relied on eugenics to justify their miscegenation legislation that prohibited blacks from marrying whites. Indeed, so many eugenics laws were enacted during this period that even Adolph Hitler remarked admirably, “I have studied with great interest the laws of several American states concerning prevention of reproduction by people whose progeny would, in all probability, be of no value or be injurious to the racial stock." Now Dunham would likely counter that Sanger did not really believe in those policies, she just said she was a eugenicist so she could gain “legitimacy.” After all, Planned Parenthood is about women controlling their own bodies, right? According to Sanger’s own words and writings, it depended on the woman’s race. During the 1920’s, Sanger announced that, "birth control is nothing more or less than the facilitation of the process of weeding out the unfit [and] of preventing the birth of defectives." But to be fair, maybe she only meant that as a self-imposed limitation on birth? She would not have advocated a state-imposed limit on childbirth, would she? “Article 1. The purpose of the American Baby Code shall be to provide for a better distribution of babies… and to protect society against the propagation and increase of the unfit. Good work, Lena! “Ugh” is a great word to describe such racist bigotry. When reading Margaret Sanger’s own writings and speeches, it becomes clear that the planning for parenthood was to be done by the fit. Those who were “unfit” would have their parenthood planned for them. And while Dunham and her fellow Hollywood elites wish us to believe that Sanger’s eugenics vision was simply her way gaining “legitimacy,” let’s not forget that Sanger was willing to go to prison over her belief in birth control. So, much of Sanger’s life reveals she was not worried about “fitting in,” and she fought for what she believed. Unfortunately for Planned Parenthood, one of those beliefs was government-sponsored sterilization and racially motivated birth control. It is interesting to note that to this day, the vast majority of Planned Parenthood’s abortions are performed on minority women (62%) and overwhelmingly prevent minority children from coming to term. (In New York City in 2013, more African American babies were aborted than were born). So regardless of what Planned Parenthood says about the evils of racism and government control of women’s bodies, it appears that aspects of Sanger’s eugenics vision are coming to fruition, albeit indirectly. If Planned Parenthood is really interested in having an honest conversation about its past, it should finally come clean about the brutality of the racist views that made up so much of its founder’s writings, and it should seek to address the overwhelming disparity in its abortion clients. It should also explain to its American supporters why it promotes, aids, and defends China’s forced abortion policies. Awkward grimaces from Hollywood stars are not enough.